I don’t know about you, but the news cycle last week really took a toll on me and once again reading was my saving grace. This year alone there has been story after story of tragedies striking high school campuses, but this month’s YA selection will if only temporarily, offer a reprieve from these dark realities. We’ve seen students respond in ways that have left us in awe of their maturity but you can’t help but wish it wasn’t necessary. Instead, longing for the days when students were more concerned with navigating crushes, trying to find out where they fit in, and figuring out their future selves like the main character in From Twinkle, with Love. Twinkle is a girl who knows her passion and purpose, and I wanted to celebrate that in this month’s box. As an aspiring filmmaker, an opportunity is knocking, and she’s ready to answer, albeit a few obstacles in her way. I don’t know if I love the charm bracelet or the accompanying quote more. Whether you’re a writer, filmmaker, or photographer, most of us can relate to having that one instrument that’s essential to us being able to do our jobs and for Twinkle that is her camera. Given Twinkle’s love of filmmaking, I couldn’t pass up the chance to laugh at one of the running jokes among us book lovers. Sometimes the movie just doesn’t get it right, but of course, we know that’s no reason not to read the book. But we’re team read the book before the movie anyway, right? Although she is young, Twinkle already knows that the odds are against her breaking into a male-dominated industry as a young woman of color. But she also understands that sometimes you must be your biggest cheerleader. Each page of this journal from Knock Knock includes a quote that will give you that extra push on the days when self-doubt creeps into your subconscious. So, there you have this month’s box! Our other two selections this month were Welcome to Lagos by Chibundu Onuzo and The Storm by Arif Anwar, so if you’re looking for more to read, be sure to check those out! 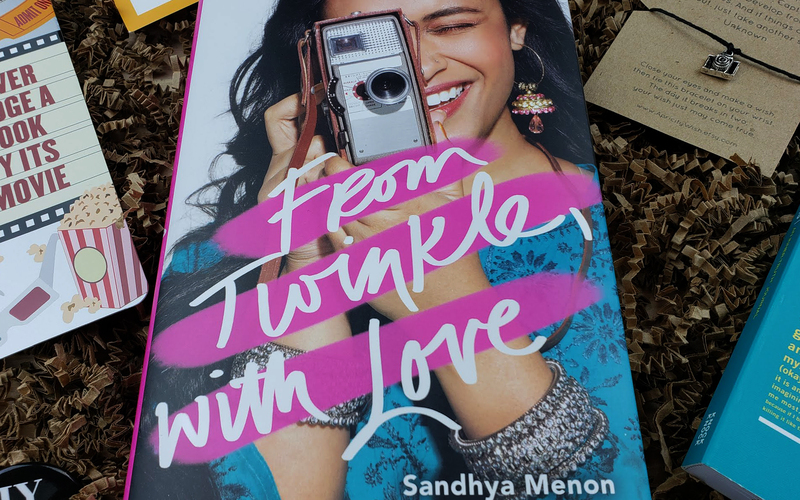 Once you’ve finished reading From Twinkle, with Love be sure to come back and tell us what you thought! Until next time!